Happy March, My Lovelies! March came in like a lamb yesterday, which is fine with me because it was primary voting day here in our state. But then things turned ugly around 5:30 or so when severe storms and tornadoes touched down in our part of the state…so the lamb turned into a lion! Oh, what a lovely article and issue....you must get it if you don't have it already! 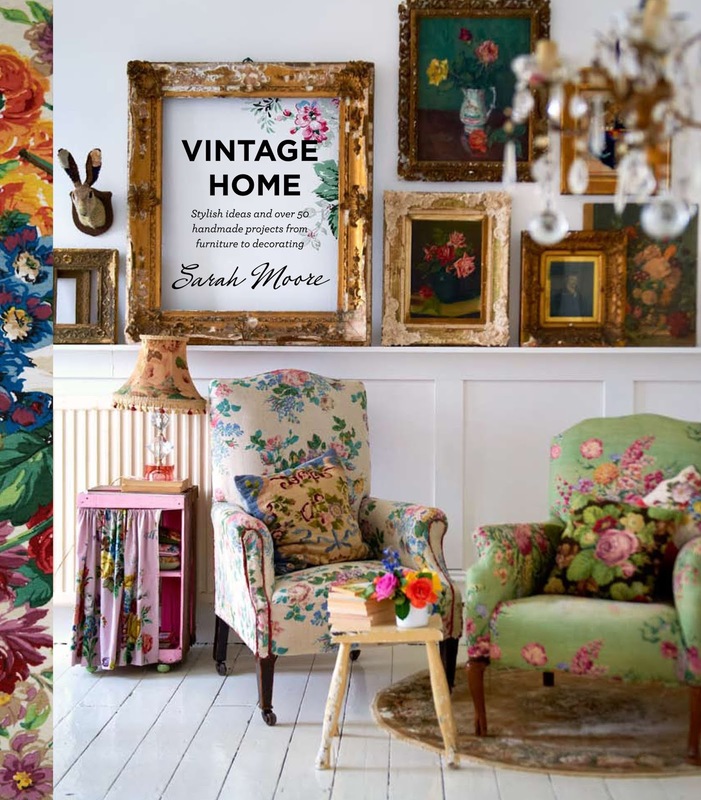 This lovely book by Sarah Moore is one of my favorite Home Decor books. 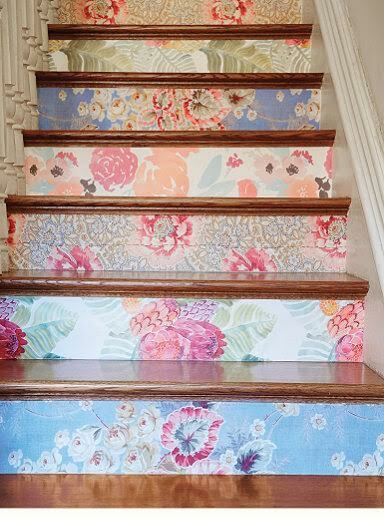 Do you remember when I papered our stair risers? Folks have giggled at me and not in a good way. Well, I like the look, and I haven't tired of it yet. You can read my post here. My tutorial for how to paper stairs is here. Speaking of flowers....Mr. Art @ Home bought me some flowers. The funny thing is he thought they were natural until I told him better. He thought they were the coolest flowers he'd ever seen! I'm busy decorating for St. Patrick's Day. 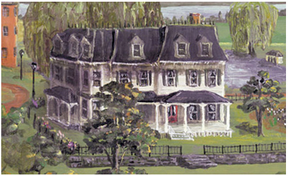 Come back late next week and see our greening of our home! Hi sweet friend! Looks like happiness and Spring is blooming in your heart and home. Ricki Jill I adore your stairs. Yes floral is back in décor style as well as color. I smiled with your husbands flower surprise/gift. Come visit and see Spring touches in our home - I egg you on, ha ha, lol. Enjoy your day and think Spring. And you certainly should feel vindicated! I love your stairs, and those people copied you! I need to look for that book. I did actually drop my subscription to CL because there just hasn't been much in it for a long time. Oh be sure to link up with Thoughts of Home on Thursday. We'd love to have you. I am so happy that floral is back in! Lets celebrate shall we! 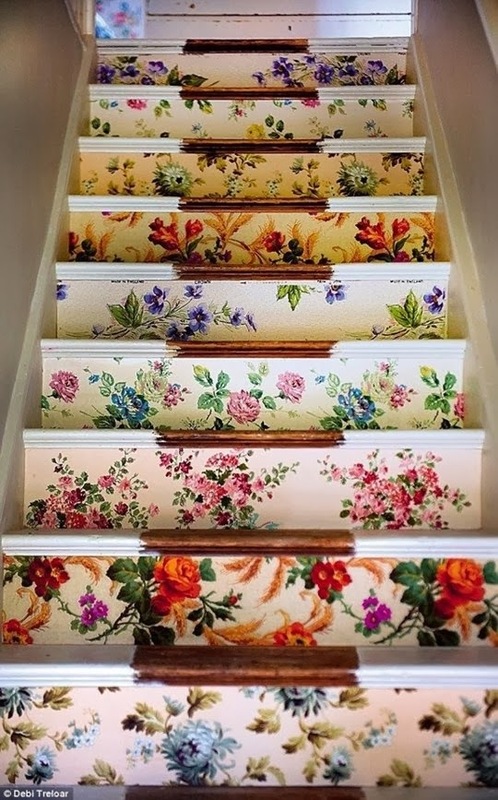 I absolutely LOVE your papered stairs. They look fantastic! 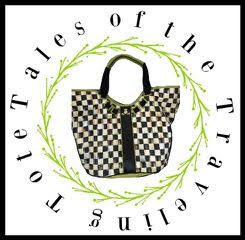 Thank you ever so much for linking up at Thoughts of Home on Thursday. Your presence adds such a ray of sunshine! I love those stairs! 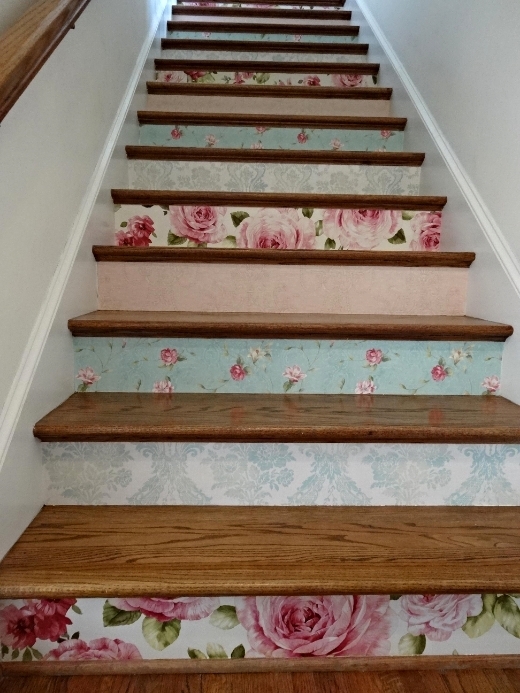 My stairs are all carpeted but it's gross and old, I'd like to peel it off and refinish them, maybe with some pretty paint or something like this on the vertical, and some pretty floor boards on the horizontal parts. Oh, my goodness! I am in love with that flora dora - I still plan to make you a patchwork heart, but my hand isn't ready for sewing yet! And I have always loved your stairs. Well, I for one love your stairs! They would make me happy every time I walked up them. The flora dora is darling as well. I love flowers and can't wait till they are popping up in my garden! Thanks so much for sharing with SYC. I will be featuring you tomorrow. Your post is awesome Ricky Jill, all in floral! 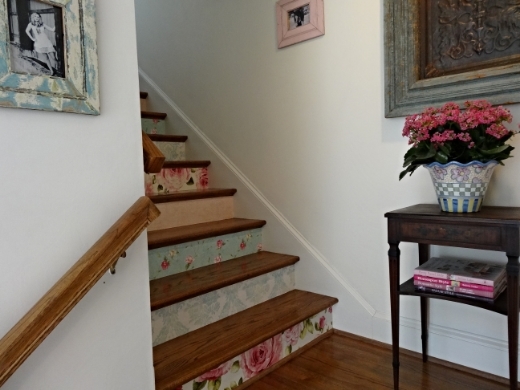 I so love your stairs with the floral inside steps, what a great style and I love that each step is different too. I like yours better then the inspiration image. I just saw you ate Share your cup. Your stairs are Fabulous !!!!!!!!!!! The stairs are gorgeous. People who laugh at creativity must have very dull lives. I've always loved those risers since day one! Love your florals too. Oh I love your stairs! A piece of art and good motivation to use the stairs...frequently! Just beautiful!